This movie includes the true miracle that saved this veteran's life; as usual, the Hollywood version left God out. Wonderful movie, I highly recommend! So very important for anyone fighting PTSD presently. One of the best movies in the last several years. Real to life. Based on a true story. Go see it. Among best movies I have seen. Maybe the best. Great to see a true uplifting story. 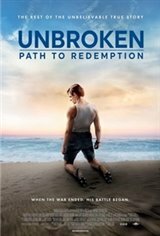 Fantastic true life story of WWII hero that was able to survive the horrors of war but not the demons of unforgiveness. The true story and acting were the BEST !! I felt like I was there with them !! AMAZING STORY!! Everyone needs to see it !!! Absolutely awesome. SO emotional. A true story that really drives home the horrors of war and the only solution!